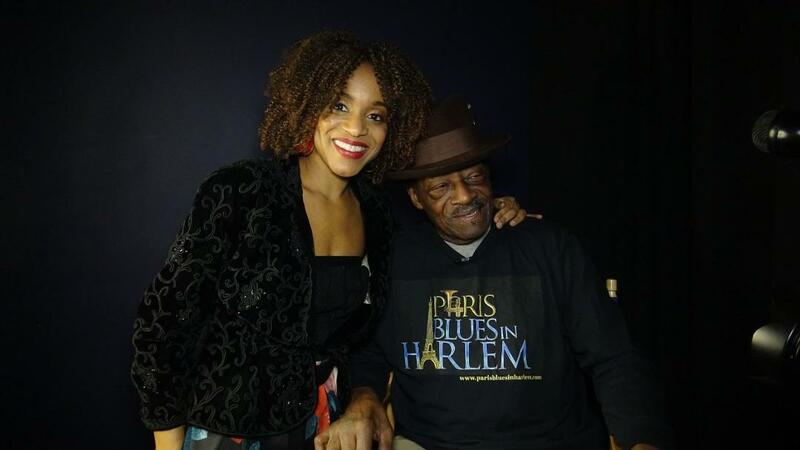 Nadhege Ptah with Samuel J. Hargress, Jr. owner, Paris Blues, the site of her “Paris Blues in Harlem” film short. Ptah’s film is winning recognition at film festivals and awards in New York City and beyond. We selected Nadhege Ptah for a two-part exploration of a woman whose art nourishes her soul – and thus ours, as well. Her activist art is created eyes open, on purpose and with purpose. I danced in my mother’s womb, and leaped my way out at seven months and became the ticket for my parents to stay in America. I continued my dance from the womb to the stage as a trained dancer in modern and ballet and performed with various modern dance ensembles. I choreographed a dance in high school for a play the Caribbean club was presenting. That piece catapulted me to present for the United Nation’s International Day and I also received many invitations for colleges and organizations. However, I never claimed myself as a dancer overtly because it only remained a hobby. There were pressures in my Haitian upbringing to become a doctor, lawyer, or nurse, as a real goal to achieve success. The arts were frowned upon, so I studied psychology while actively dancing for modern dance companies. I went on to pursue a master’s degree in forensic psychology. I reached a cross road during graduate school, which derailed my next steps to obtain a Ph.D., and studied drama. It was then that I began to find my voice and passion through various mediums of performing and developing other artistic skill sets as a writer, producer, and director. Overall, I am a creative storyteller using several artistic disciplines that display honest human stories with the intent to inspire and ignite change. I was always drawn by movies, Broadway, musicals, drama, music videos, performances in general. I loved to sing, dance, act and put on shows as a child. I got teased in college for watching music videos all day. I was particularly drawn into the music videos that mirrored a film, like Michael Jackson’s Thriller. I loved the videos that melt the artist’s song into a mini-movie. I would say the visual of capturing a story, magnifying it on a huge screen, and reaching a big audience sparked my interest to transition into being a filmmaker, which encompasses all of my artistic passions. I have various artistic disciplines that began my journey as an artist from dance, acting, and writing that were and continue to be expressed on stage and film. So, creativity is my first love. Depending on the season one artistic medium takes precedent over the others. Tell us about your Harlem. How has Harlem inspired you as an artist? My Harlem weeps for what once was, a painful adjustment to the change. Harlem has a bold and spicy flavor filled with electrical energy of entertaining people. As an actor and writer it’s a great place to watch and study characteristics, it fuels the creative juices. Also, the legacy, history, and memories still linger with the elders in the community, like my former neighbor who passed and shared personal stories with his friendship with Malcolm Little before he became Malcolm X. One can’t learn that from the history books. The engagement in real time and hearing the stories inspires me to carry the baton. What are your homelands? How does “home” – real and imagined – figure into your work? Interesting question of homelands because I was born in America, but raised culturally by my parents’ homeland in Haiti. So, I experienced being in between two culturally different homelands. I was navigating the African-American experience with a Haitian upbringing. My inner world of imagination was home for me, it allowed me to feel safe, create my own and be accepted without having to prove my allegiance in language, music, food, etc. So, my imagination plays into my work and pulling from various “homes,” which is essentially the best homeland my work derives from. When you are an emerging artist, graduate to an evolving artist. Once you come into view and get notice, then what? There are so many artists who emerged but never evolved. So, continue to develop, progress and advance in your craft and self. What advice would you offer local mothers who are trying to complete projects of their own? You can’t do it on your own. It takes a village to raise a child, so the concept applies for projects. Find like-minded people who are supportive, share the same goals, and just do it.